It's taken me a while to get through this, despite it being a little excerpt book. To be frank this one has just left me cold. There isn't anything in here that I want to cook and it hasn't being particularly inspiring, or anything else for that matter. Not my cup of tea.This is affluent 1920s London society, and mini chapters... I think they were originally newspaper articles... about all the various social and dining occasions, and what one ought to do, and of course, what one ought not to do. I found it a bit snooty, and rather down on women - apparently they're useless in comparison to men, according to one of these chapters. For today's audience the recipes aren't as accessible. Sugar loaf, anyone? And I don't think aspics are done anymore, although there's plenty of the things in here. And on advising on the proper way to arrange a picnic for a driving jolly out into the countryside, she's including booze. My, how the times have changed. Although one line did make me turn a wry smile: from the country friends on a Christmas shopping trip: "God made the first Christmas, and man has ever since been busy spoiling it. Year by year the propaganda of the shops grows increasingly active..." (p.15). My dear Agnes, be glad you aren't around today! I really enjoyed reading this. It was like an old fashioned snack - say bread and dripping, which they tell me is actually quite delicious in the right place and time. The writing is lively and and amusing and made me wonder if the wonderful Nigella has been influenced by the writing of Gertrude Jekyll. Though some of the recipes are a little heavy on the aspic for my taste, I was surprised at how modern and sophisticated other recipes were, such as panettone and grisini for example which I wouldn't have thought was being cooked in England in the early 1920s. A lot of fun to read, if you're at all interested in the way people cooked in the past - in this case in the 1920s in England. Lots of interesting differences between then and now, many having to do with the fact that many people were still cooking with fire. And making gelatin from calves feet, which is not something I'm prepared to undertake. Interesting to read about, though! A slim volume in the Penguin Food series...a set of essays on food by perhaps one of the first Food columnists. If alive today, Agnes Jeckyll would probably have a blog. This volume fits neatly into your bag to take with you in case of having to wait somewhere. Were Harriet Vane in need if cookery advice, this would do! Perfectly insane weirdo old cook book. A fascinating book, by the tone and information contained it is all totally out of date and deals with the "niceties" of the day on which food to use for picnics, what constituted as nursery food, what to give a party of guests before and after a theatre performance, how to deal with guests that were either too fat or too thin etc so political correctness goes totally out of the window but the lack of it actually makes this a very refreshing read and at times pretty hilarious as you are supposed to give "Hot Bovril and sandwiches to your drivers as you wait. "Consequently the class divide is very apparent so the reader has to assume the writer obviously is of an upper class background as highlighted by the situations and even down to the food that is described.You have to accept this for what it is, a historical writing on all aspects of food preparation, when and how to serve it and other social precepts of the time.As applicable and practical to modern day ethics, no one has the etiquette, the time or even the effort to bother with half of the practices mentioned but as an historical narrative its very interesting as it highlights sadly, a lost and forgotten time of social graces that are lacking today.Written in a witty yet candid and familiar way, one can almost apply the term "friendly" as the writer casually addresses her audience so the reader feels more at home with author.Definitely worth reading if you are just generally "into" food or if for the more serious reader the more historical and social aspect. 'Self sacrifice is the noblest thing in the world, but to sacrifice other people, even for a noble thing, is as wrong as persecution.' -Mary ColeridgeNot every book of recipes will gift you with such quotes and additions as this. This very slim volume is a collection of columns written by Agnes Jekyll (sister-in-law of the famed gardener Gertrude Jekyll) during the 1920s in a Post War/Pre War England. The recipes are fun to read if impossible to replicate unless you feel confident that you know what teacup to use for "a teacupful of flour". Ms. Jekyll has that thing that is tiresomely referred to as a "dry wit". Someday we will figure out a new way to say that. Until then, let it stand as it is. "God made the first Christmas and man has ever since been busy spoiling it." she says in her section on what to serve for a Christmas shopping luncheon for friends. This Penguin series has been thoroughly enjoyable and I hope Penguin releases the complete series in the U.S. as only a partial release has happened so far. So much aspic. Just...soooooo much aspic. Pretty much all the recipes in here are highly entertaining, and not merely because SERIOUSLY GUYS, EVERYTHING IS BETTER IF YOU ADD SOME ASPIC. But I also enjoyed the fun instructions like "Prepare a farce from veal or the best parts of a rabbit in the usual way." Oh, sure, in the usual way. Usually I prepare my farce with lots of sexual indiscretion, mistaken identities and rapid exits stage left. I assume that's what she meant.It's hard to choose but I think my favorite recipe is the one suggested to tempt the appetite of a picky invalid, wherein you make a sort of casserole of layers of cold runny mashed potatoes, cold sardines and whipped cream. MM-MMM.Apart from the enjoyable hilarity of the recipes, I genuinely liked the prose, which is basically a series of admonishments to treat food with respect, and to be generous and thoughtful when hosting guests (or when feeding yourself). Even though her ideas about how to do this look odd to a modern eye, it's good advice in a general way. I received this book for Christmas as part of the Penguin Books Great Food series. The books in the set are reprints of classic food writing, some are memoirs more than traditional cookbooks. This book, A Little Dinner Before the Play, consists of extracts from The Kitchen Essays first published in 1922.I really enjoy cooking and reading about cooking and this was a fascinating glimpse into some historical perspectives about food, food service, and cooking. Political correctness is nowhere to be found here with chapters on what to feed the too thin and the too fat, along with ideas as to why the guests are too thin or too fat. There are many recipes that I have tried in more modern formats and much basic cooking. There are even ideas for Meatless meals which is a theme that continues on today in the common meme “Meatless Mondays”.I enjoyed reading this book and look forward to reading others in the Great Food set that I have. Continuing in my series of historical cooking books, this is the most approachable but perhaps therefore the least interesting of the lot. Not that it's not still interesting, it just lacks some of the exoticism of books from farther in the past. Still, this gives a lovely insight into high society dining and entertainment from the beginning of the last century. It would pair very well with Emily Post's original etiquette guide (which is itself absolutely fascinating reading).Amusingly enough, I think comparing this with the medieval cookbook results in about the same ratio as "that sounds delicious" and "really, people ate that?" I truly do not understand the impulse to suspend everything in aspic. 1920s cooking, I hold you responsible for the Gallery of Regrettable Food and the mass of unfortunate Jell-O salads in the 1950s. A delightful, little foodish book! Actually, this is a compilation of hostess-with-the-mostess newspaper articles written by the author for the London Times in the 1920's. Each article suggests cuisine for different situations, such as a couples' first dinner party, tea time, a Sunday supper, meatless meals, food for traveling, and the title (among many others). The articles include what courses to serve and when, and recipes to make some of the suggested dishes. The advice reflects the societal norms of the time, and assumes that the persons reading it have some kind of hired help in preparing most of the food, but it does provide a wealth of information and some rather interesting ideas for meals. A quaint little time capsule of food writing that has wit and verve. While some of it might seem quite modern with passages like 'God made the first Christmas, and man has ever since been busy spoiling it. Year by year the propaganda of the shops grows increasingly active ...' yet often the recipes show their age - there is a lot of aspic involved, and suggestions for things like tinned turtle soup.That said, it is still charming - Jekyll writes with a light touch, and a love of food and sharing it with others is what shines through. I read this whole thing out loud to my mother over an evening and we both whole-heartedly enjoyed it. 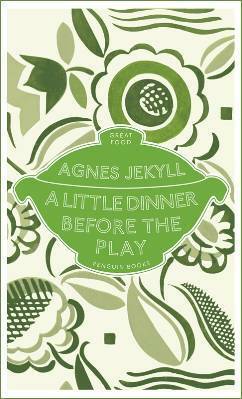 Jekyll refers to dishes on a menu as companions for the meal, lambasts roadside restaurants, and describes meals with warm, colorful language. We didn't come out of it with a whole lot of recipes to try but we did have a lot of laughs. You'd have to be really into vintage cookery (as I am) to enjoy it, but I found it a treat. And yes, they did add aspic to everything. Fascinating book of New York Times articles from the 1920s about food and society. Really enjoyed this one - very interesting to see what was considered fine dining in the 1920s. The liberal application of aspic to EVERYTHING provided much amusement. Agnes Jekyll - Dame Agnes Graham Jekyll DBE (12 October 1861 – 28 January 1937) was a Scottish-born British artist, writer and philanthropist. The daughter of William Graham, Liberal MP for Glasgow (1865-1874) and patron of the Pre-Raphaelite Brotherhood, she was educated at home by governesses, and later attended King's College London.She was created a Dame Commander of the Order of the British Empire (DBE) in 1918 for her public works. Lady Jekyll first published Kitchen Essays (1922) in The Times, reprinted in 2001 by Persephone Books, "in which she was persuaded to pass on some of the wit and wisdom of her rare gift for clever and imaginative housekeeping".